As one alive he hitherto shows forth to be living. Anoub was one of the seven brothers of Poemen, whose sayings occupy a large place in the Apophthegmata. Three of the brothers, Anoub, Paisius and Poemen lived together at first in Scetis, with Poemen as their leader. After the first devastation of Scetis (407-8) they went with their brothers to Terenuthis where they decided to stay together and live the cenobitic life, with Anoub taking charge. The Devastation of Scetis marks a turning point in the history of early monasticism in Egypt; the monks dispersed, and gradually the center shifted from Egypt to Palestine. This story of Anoub and his brothers indicates a new reason for the formation of cenobitic communities, that is, protection against invaders. It is said he suffered for his Christian faith prior to becoming a monastic. He reposed in peace. 1. Abba John said of Abba Anoub and Abba Poemen and the rest of their brethren who come from the same womb and were made monks in Scetis, that when the barbarians came and laid waste that district for the first time, they left for a place called Terenuthis until they decided where to settle. They stayed in an old temple several days. Then Abba Anoub said to Abba Poemen, 'For love's sake do this: let each of us live in quietness, each one by himself, without meeting one another the whole week.' Abba Poemen replied, 'We will do as you wish.' So they did this. Now there was in the temple a statue of stone. When he woke up in the morning, Abba Anoub threw stones at the face of the statue and in the evening he said to it, 'Forgive me.' During the whole week he did this. On Saturday they came together and Abba Poemen said to Abba Anoub, Abba, I have seen you during the whole week throwing stones at the face of the statue and kneeling to ask it to forgive you. Does a believer act thus?' The old man answered him, 'I did this for your sake. When you saw me throwing stones at the face of the statue, did it speak, or did it become angry?' Abba Poemen said, 'No.' 'Or again, when I bent down in penitence, was it moved, and did it say, "I will not forgive you?'" Again Abba Poemen answered 'No.' Then the old man resumed, 'Now we are seven brethren; if you wish us to live together, let us be like this statue, which is not moved whether one beats it or whether one flatters it. If you do not wish to become like this, there are four doors here in the temple, let each one go where he will.' Then the brethren prostrated themselves and said to Abba Anoub, 'We will do as you wish, Father, and we will listen to what you say to us.' Abba Poemen added, 'Let us live together to the rest of our time, working according to the word which the old man has given us.' He made one of them housekeeper and all that he brought them, they ate and none of them had the authority to say, 'Bring us something else another time,' or perhaps, 'We do not want to eat this.' Thus they passed all their time in quietness and peace. 76. 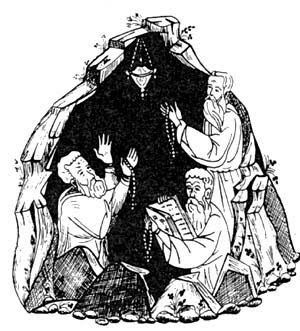 One of the Fathers related this about Abba Poemen and his brethren: 'When they were living in Egypt, their mother wanted to see them and was not able to do so. So she took note of the time when they went to church and went to meet them. But when they saw her, they made a detour and closed the door in her face. But she beat on the door and cried with tears and groans, saying, "I must see you, my beloved children!" Hearing her, Abba Anoub went to Abba Poemen and said to him, "What shall we do with this old woman who is weeping against the door?" From inside where he was standing, he heard her weeping with many groans and he said to her, "Woman, why are you crying out like this?" When she heard his voice, she cried out even more, weeping and saying, "I want to see you, my children. What will happen if I do see you? Am I not your mother? Was it not I who suckled you? So I was troubled when I heard your voice." The old man said to her, "Would you rather see us here or in the age which is to come?" She said to him, "If I do not see you here, shall I see you in the age to come?" He said to her, "If you refrain from seeing us now, you will see us yonder." So she departed full of joy and said, "If I shall see you perfectly yonder, I do not want to see you here.'" 108. It was said that if one of the brethren came to see Abba Poemen the latter used to send him first to Abba Anoub, because he was older than he. But Abba Anoub would say to them, 'Go to my brother Poemen because it is he who has the gift of speaking.' Whenever Abba Anoub came to sit beside Abba Poemen the latter refused to speak in his presence. Relate to us a useful word! Three elders asked him, the three together. To me the martyr's wreath, He did not want to give. To me, they brought heavenly food. Holy and joyful, heavenly faces. And Paradise wonderful, wonderful and sweet. And all the dark satanic hosts. Forgive me elders, Anoub the sinner!